This is gorgeous!! LOVING the photos, the colors and you have been rocking the cork bits lately!!!!!!! Another stunner of a layout and such a cute story about how the little guy fell asleep to her brushing! love the page - so sweet and I love the story. The best career is one you are passionate about. I wish her all the best! (And you, too!) Such a fun page. Love all the bright elements. Sounds like you have the perfect "to be vet" on your hands, adorable! Beautful and fun. Sounds like your dd is well on her way to so something she loves, nice to hear you are able to encourage her interests. wow LOVE all the details!! awesome as usual lisa! Wow, Lisa!! I could spend hours looking at all the amazing details on your page. Just gorgeous!! This is SUCH a fun layout!!! 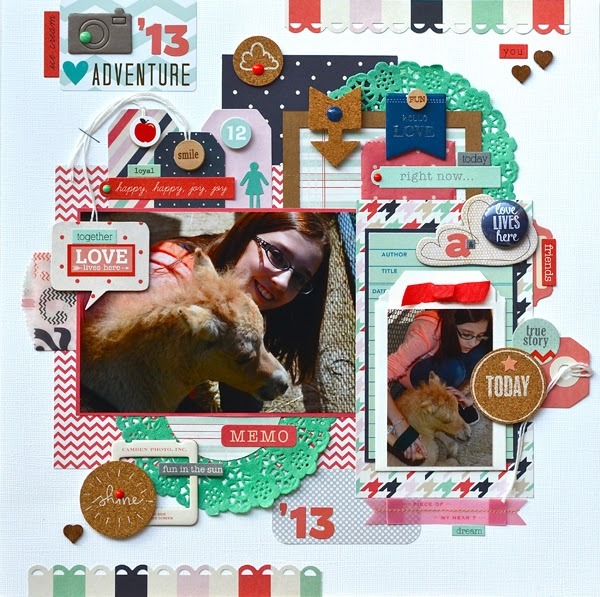 What a wonderful layout Lisa! Where is this petting zoo - I'd love to take my nieces! Very fun layout. I love the story and how cool is that she got to hold a baby horse. Memories ... it's what it's all about. Great job capturing the moment in a layout. What a sweet story and adorable photos. I sure hope she keeps that dream and it comes true! I love your layout. I had a harder time with this collection for some reason. I love how you used it! what a great story (ours love animals too) Love that you made a layout of that~beautiful work Lisa!!! Congrats on your hazel win!!! love it...amazing details and adore the splash of mint! I love this Lisa. The design and placement of all the bits and pieces is wonderful. Great story too. LOVE the Trendsetter on your layout Lisa!! so cute! Love that cork!!! I really love those colors Lisa! Beautiful work! That is so sweet. And yes expensive! Lol. LOVE this beautiful page! 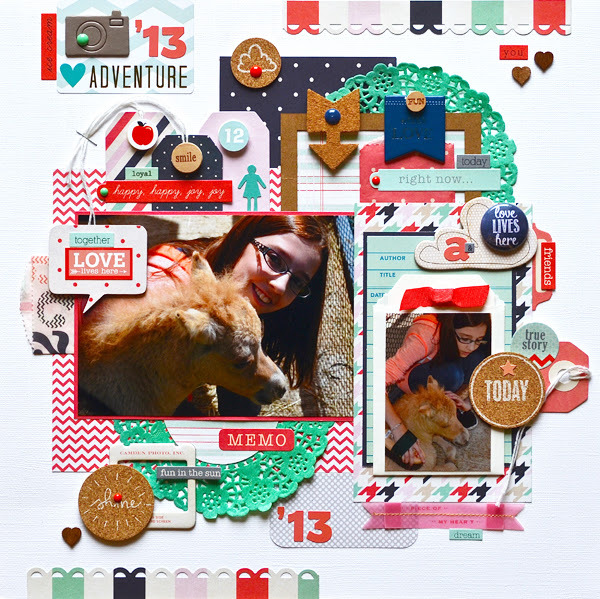 Your layering and design is amazing! Just amazing. You are so talented with layering!! !